All Charts thanks to zerohedge.com, which goes more into depth on this issue here. If you can explain what is going on in asset markets right now, you are among the few. The pundits are all over the place trying to explain how a struggling 6 year recovery can be producing a massive stock market bonanza on the upside, very close to 2007 housing prices, $100 a barrel oil, and out of control junk bond markets. Slowly, but surely, one at a time, major economic leaders are coming around to one conclusion: Too much money chasing too few goods - NOT, mind you, in the general economy - but in traded assets. Even the current government is starting to understand that the 1% or even the 5% has taken all the advantages of even the minor improvements in income and wealth since 2010. They did this by borrowing at rates that are artificially reduced to near 0.00% by the Fed. The money is not going to main street to expand small business. It is going to wall street to buy assets. What does any of this have to do with housing? The housing market has been driven by cash buyers of distressed properties up until now. 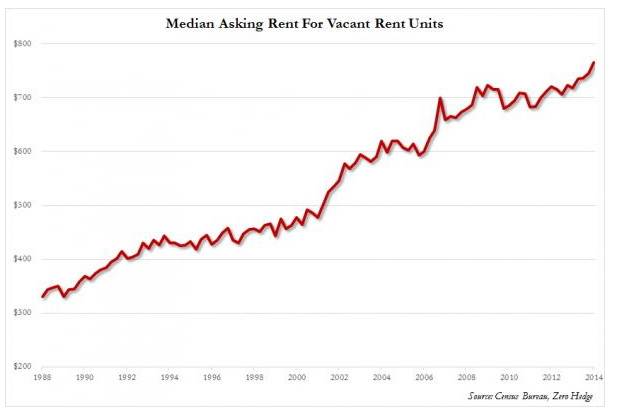 Rents are at all time highs, and not coming down, because folks who were in trouble with their mortgages sold out to corporations, foreign investors, and local landlords who saw a chance to buy low. Those folks are still scouting good deals, but they have slacked off from the rampant pace of a year ago. Today you are left with some speculators and a few regular buyers and no sellers. Why would someone sell a home that is now owned with a 3.5% or 4% mortgage. You'd rent it out if you needed to move, and get another home with a 4.5% mortgage. Speculators who bought low a year ago were not in for the flip. They are able to get great rents. And they can borrow money below the current mortgage rates if needed. Here is the coming rub. Family formation. People are already living more tightly than they did in 2007, and as middle class incomes stagnate, and young adults have few high income options available, the number of people per household is climbing. This is not sustainable. The population continues to grow faster than the housing, so there will be a breaking point. How do you play the breaking point if you are just a regular Joe needing a place to lay his and his family's weary heads? A very good question. 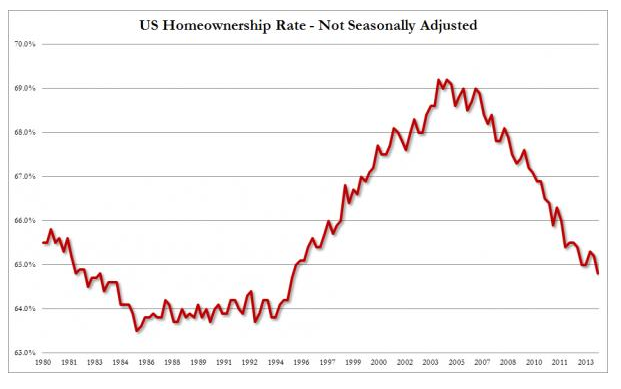 But any analysis of the above suggests that prices of homes and mortgage rates have to go up. That means more people thrust into the rental market. It is hard to imagine a scenario where prices come down, unless the system completely collapses. There are those who believe it will. But the kind of catastrophic collapse they are talking about will take average guys like you and me down with it no matter what. More likely is that when the bubble bursts this time, we will get double the pain we should have gotten in 2008. There will be no way to save the losers this time. We will all just have to suffer through it, and most of us will come out okay. So, what is prudent today? Make your decisions locally. That means that local conditions in real estate will provide you with a set of possibilities to select from. It also means that your own circumstances are local to you. Income, job stability, family changes, and location preferences are still the main drivers of real estate purchases or decisions to rent. If you are likely to stay in one home for 10 years or longer, this is probably as good a time to buy as any. If you are likely to need to or want to sell in a couple of years, you might be better off renting. But then, predicting the economic future is harder than predicting the weather, and that is still not even close to possible. If you are in the market to purchase a home for your own use or as an investment, and you need to secure a mortgage for that purpose, please call Bill Rayman at GuaranteedRate.com. His experience will be invaluable to you in helping achieve your goals.